Toronto's Don Valley might be a continent and a climate away from Whistler Blackcomb and the ski resorts of the Rocky Mountains but that hasn't stopped hardy locals strapping bits of wood to their feet and shoving off down the hillside in the name of a good time. In fact, the Don and its broad valley have supported numerous winter sports like curling, skating, and tobogganing for well over a hundred years. In the 1920s, the Toronto Ski Club held their annual meet in the valley, building a network of trails and some seriously gnarly jumps for thrill seekers and professional athletes from across the world to tackle. 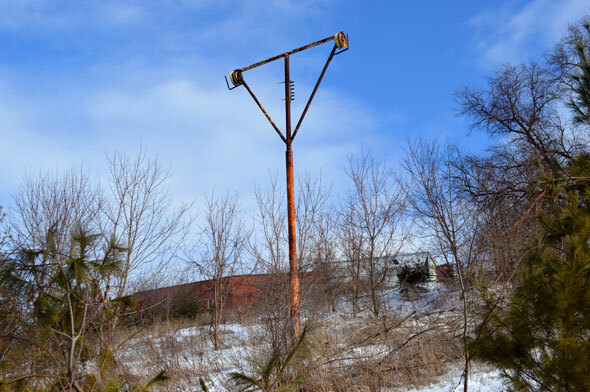 Later, a purpose built ski resort arrived near Lawrence Avenue complete with an electric lift. Evidence of it is still there, but the skiers a long gone. 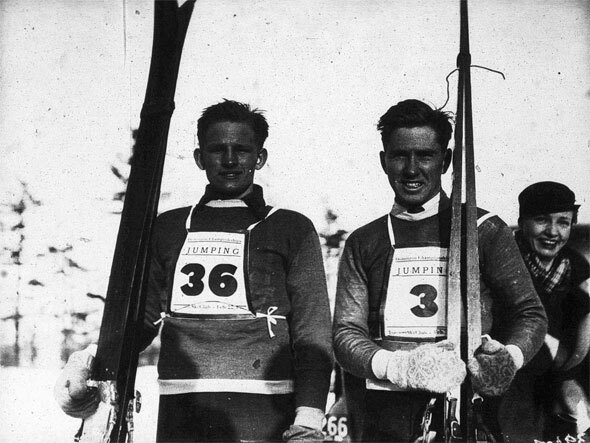 According to the opening pages of the Toronto Ski Club's official retrospective, the first Toronto skier was a man of "Alpine and Scandinavian blood" who carved trails through High Park with 10-foot skis and a bamboo pole some time in the late 1800s. The book confidently reports that he wore a Swiss yodeling hat, a German backpack, and English wool socks on his pioneering runs, calling "Yah-voh!" through the quiet park. Despite the sartorial detail, there's no name attributed to the bizarre (and possibly fictional) man in question. Early skiers usually traveled solo or in very small groups around High Park and North York on long planks of hickory, each generating momentum with a single pole, like a river punt. The story recalls how the device doubled as a weapon against "wolves or marauding Indians." "At that time, however, Indian hunting was illegal during the winter months," it coolly goes on to note. 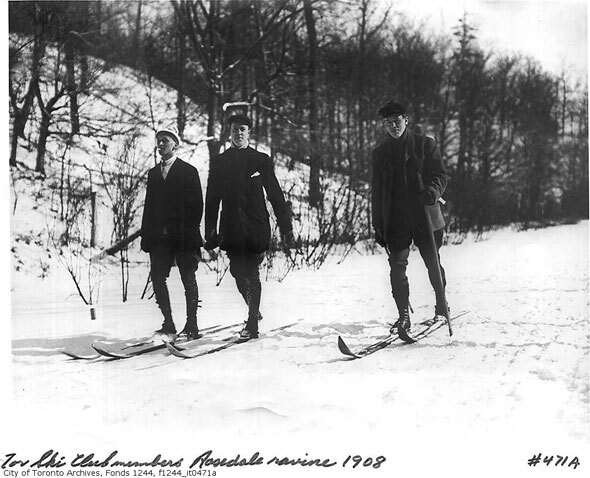 By the 1920s, the Toronto Ski Club, possibly already in its second incarnation, had organized to the point where it was holding regular meets in High Park and Rosedale Ravine. Reading from the society pages of the Toronto Star printed at the time, the events appeared to be an all round civilized affair where ladies and gentlemen could be seen, and hopefully discussed, afterwards. The fact Toronto was often "badly handicapped by lack of snow" didn't seem to be much of a problem. The Globe and Toronto Star carried pictures almost every year of delighted looking men and women enjoying the brief pleasures of a Toronto snowfall. 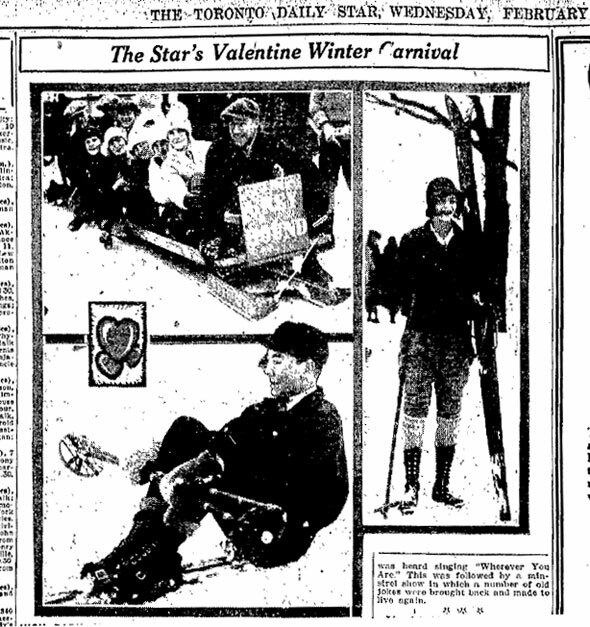 The club was popular from its inception and its leading lights soon teamed up with the Star to run an annual Valentines Day winter festival of skiing and sledding. Though the events were undoubtedly a well-attended, the paper's claim that "most of the city" were in the High Park in late February 1926 seems like a bit of a stretch. The Valentine Winter Carnival also featured skijoring, a cross-country event where skiers are pulled by horses or dogs, and a bobsleigh run. Always in search of fresh piste, the TSC had agreements with several golf course owners who would allow the club's members to use the fairways for the few weeks a year they were blanketed in snow. Patchy coverage during Toronto's occasionally mild and inconsistent winters meant the adrenaline junkies would have to up the ante beyond the landscaped lawns and gentle valleys. 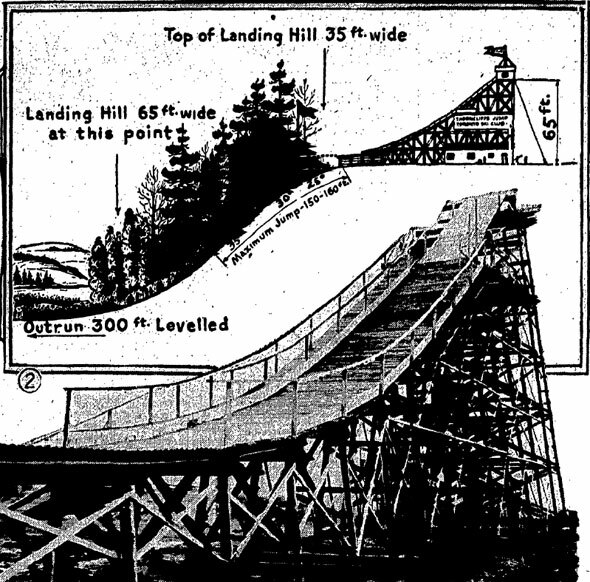 In 1934, the club announced it was building a giant 30-metre ski jump on the lip of the Don Valley at Thorncliffe. Olympic skiers from across the country would power down the ramp, lubricated by 100-tons of ice shavings shipped over from Maple Leaf Gardens, and launch more than 40 metres out into the valley. An area near the bottom of the slope would be cleared for the roughly 10,000 spectators the club expected. The winner of the event that year was 17-year-old Teddie Zinkin, a local Toronto boy who managed to clear a distance of 34 metres from the bottom of the ramp. By the next year the organizers were predicting jumps 15 metres longer than that. Enthusiastic amateurs and other organized groups like the short-lived East York Ski Club were also using the lower Don's slopes for winter sports. As naturalist Charles Sauriol recalls in his book Tales of the Don, "people went up and down the slope without much attempt at skill." "It's amusing to recall I once went to the park on a Sunday in the mid-thirties, put on my skis and was ready to go down the slope when a park patrolman told me that I couldn't ski on a Sunday. It wasn't allowed." Sauriol recalls the Thorncliffe jumps in the same book, noting there were actually two towers; one for practice and one for the actual event. On an interesting sidenote, the Star reported a woman lost her diamond wedding ring while gathering snow at Maple Leaf Gardens for the jump. It was never found and presumably made its way to the Don with the rest of the shavings. 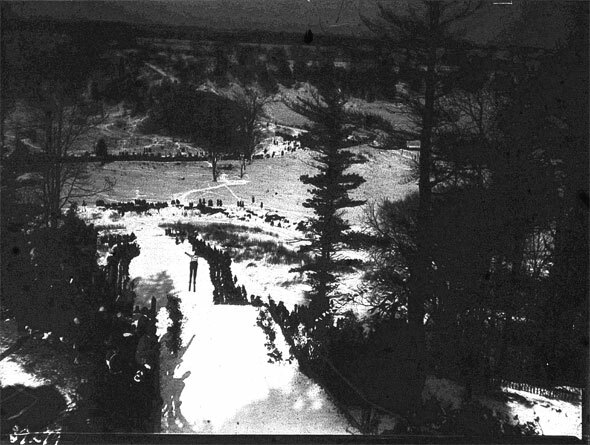 Stymied by inconsistent snowfall, the Toronto Ski Club gradually shifted north to the Forks of the Credit, then Huntsville, before eventually settling at their present location near Collingwood. Back at the Don, skiing continued informally on clearer sections of valley wall. Hoping to capitalize on Torontonian's appetite for easily accessible winter activities, the Don Valley Ski Centre opened on a relatively gentle hillside at Milne Hollow near Lawrence and the Don Valley Parkway. The resort was privately owned and featured three lifts - two rope and one Poma - and a $70,000 artificial snow-making machine. It would need it too - inconsistent weather hampered the business for decades. Lift passes were affordable, at between $3 and $5, roughly $10-$17 in today's money. The wide series of several 200-metre runs ran from the top of the slope at Railside Drive to the flat bottom of the valley roughly 40 metres below. Visitors could hop over a series of modest ramps on the way down or, as Glen McTavish did one year, take off in a hang-glider. McTavish was attempting to break the Canadian record for the most airtime created from a running start. Unfortunately, he had to settle for a time considerably under the five and a half hour record when the weather once again refused to play ball. A 1974 photo on the front page of the Toronto Star shows the luckless adrenaline-seeker floating just a few feet above the skiers below. The Don Valley Ski Centre business continued to be "financially marginal" year-to-year and there's no mention of it in the papers past 1976. One report suggests it may have closed for a short time before reopening and then vanishing for good. The remains of the hill are still visible among the low, scrubby trees and brush south of Lawrence Ave.. The path up the hillside to the only remaining lift pylon is crossed by the tracks of deer and other animals. If it wasn't for the rusting structure still easily visible from the East Don Trail, one might not guess anything was ever there. A concrete abutment and scattered wooden remains of a shelter poke out from beneath crusty snow. The constant static from the Don Valley Parkway is the only sound. On my way out of the valley, a woman walking her dog told me that her friend used to ski down the opposite side of the valley for many years. Have you ever tried skiing down the slopes of the Don Valley? Do you have any memories of the Don Valley Ski Centre? Tell us below. Image: City of Toronto Archives, Toronto Star, Chris Bateman/blogTO.